For the complete Powertrax application guide, click on the logo above. The original locking differential that could be easily installed in existing case assemblies without any special tools or setup equipment. It has been widely used in demanding off-road applications around the world requiring extreme traction output and high-strength. Because the Lockright eliminates wheel spin-up and therefore its associated driveline trauma is negated, the strength and integrity of its surrounding original case and other driveline components are, in effect, substantially increased. Cases that occasionally fail with open or limited-slip/posi differentials become one of the strongest links in the drive train when equipped with the Powertrax Lock-Right Locker. The Lockright has been used in the harshest conditions around the world by hard-core offroaders., in towing applications, and even United Nation vehicles in rugged terrain. For traction output, strength and durability, the Powertrax Lockright Locker rivals much more expensive competitive lockers sold only as complete case replacement assemblies. It is a leading product because the Lockright delivers as much traction output, its end assembly is exceptionally strong, is much less expensive, and does not require professional installation (because the complete case assembly does not have to be replaced and realigned with precision calibration equipment). An excellent choice for off-road vehicle applications, performance enthusiasts also began using the Lockright Locker to satisfy their extreme traction requirements for racing, hot-rods and muscle cars. The Lockright's operation is fully automatic. Designed to send the engine power to the wheels with the most traction, the Lockright will help get you where you want to go. While traveling straight the Lockright will lock the axles together similar to a spool. However, when the wheels need to differentiate in a turn, the Lockright will allow the outside wheel to rotate faster to complete the turn. The internal gears on the Lockright will overrun each other to allow this differentiation. PLEASE NOTE: we cannot accept return of lockers that have been installed. If you have any doubts or questions about your axle, please ask any questions to make 100% certain you are ordering the correct kit. You can email our store or call during business hours. To assist in identification of your axle by looking at the shape of the differential, we have prepared a differential chart. Please click go to the chart for identifying your axle type. If you find a lower price on Lockright Lockers, we won't just meet it...we'll beat it! Some 94-95 Jeep Wranglers may have an ABS carrier even if vehicle is non-ABS. 1996 and up Wrangler will all have ABS carriers. With or w/o vehicle ABS. Also, 1987-1989 Wranglers may require additional cross-shaft since there are two possibilities and no way to tell externally which you need. Be prepared for this eventuality (optional cross-pin is $12 additional). With a standard open differential (found in 4WD vehicles).... If one of the four wheels loses traction, lets say the right rear, the rear differential senses this as less resistance and makes that wheel spin. A spinning wheel does not move the vehicle. The other wheel on the same axle (on firm ground with plenty of traction) gets the same amount of torque as the spinning wheel. Not much. Both wheels together do not produce enough torque to move the car. A differential always distributes torque equally. The amount of torque generated at the wheel with the least traction determines how much the other wheel will get - the same amount of very little. Little torque because traction is low at the spinning wheel. Should the right rear wheel have lost traction due to a height difference on the trail or some slippery situation as snow or mud, the left front wheel will also lose traction and spin even though the ground under the front axle is level. This diagonal wheel spin is very common. So, the right rear and left front wheels are spinning. Bottom line...YOU ARE STUCK! Limited Slip Differentials, the name says it all, they limit wheel slip. They do not prevent wheel slip. They only limit wheel slip. Traction is lost later than without limited slip. Looked at another way, you will be stuck a little later. Traction will be lost when more torque is needed to move the car. Limited slip creates additional resistance and allows for a higher torque value to be produced at the wheel with less resistance. Even though LSD is a help in light duty situations it truly doesn't do anything when the offroading goes beyond a standard flat dirt road. Fancy names like Trac-Loc are not differential locks - they are disguises for limited slip differentials. Differential Lockers or diff locks are the only cure for the known shortcoming of differentials sometimes not distributing enough torque to the wheels as described above. 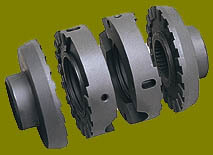 Diff locks disable the differential's ability to sense resistance. By disabling (locking) the differential it is forced to send equal amounts of torque to the left and to the right wheel. This guarantees that any wheel with traction will receive torque to move the car. Diff locks will make the difference between STUCK and still DRIVING. Rocky Road gift certificates! Good for any product we offer and they never expire. Click here to go back to our main Powertrax page and to view info on NoSlip lockers.